France's victory over Italy at the Stade de France set them apart as the premier attacking side in the northern hemisphere and also ensured that the final week of Six Nations action would see a team in contention for that most coveted of prizes: a Grand Slam. France waited a long time for their first clean sweep but success over England at the Stade de France on Saturday would ensure a third since the advent of the Six Nations - a new record. 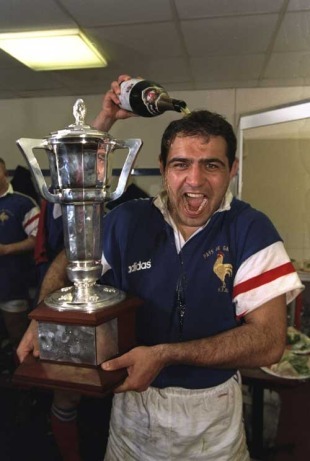 In our latest Scrum Seven we revisit some of Les Bleus' most celebrated victories. France's maiden Grand Slam was secured in Cardiff, 58 years after their admission to the tournament. The home crowd created a stir before the game with widespread booing and whistling during the playing of God Save The Queen and the Welsh Rugby Union also came in for severe criticism due to the lacklustre playing surface. France had seen off Scotland 8-6, Ireland 16-6 and England 14-9 on their way to the final round and it was the Camberabero brothers who saw them home in the mud, having trailed 9-3. Scrum-half Lilian scored one of two tries, with skipper Christian Carrere scoring the other, while fly-half Guy landed a drop-goal, penalty and conversion. Sandwiched between years of Welsh dominance, this brilliant French side made a mark. With a tight-knit squad they produced some masterful rugby under the guidance of scrum-half and skipper Jacques Fouroux. Using only 15 players for the tournament they finished without conceding a try, notching their crucial victory against a classic Wales side at the Parc des Princes, limiting them to three Steve Fenwick penalties. Their final blow was landed in Dublin, where Fouroux teamed up with fly-half Jean-Pierre Romeu behind the stunning back-row of Jean-Pierre Rives, Jean-Claude Skrela and Jean-Pierre Bastiat to comfortably steer the ship home. France's 1981 Slam was a mixed bag for the late Pierre Lacans. With Scotland falling 16-9, Ireland 19-13 and a fading Wales 19-15, France arrived at Twickenham for a game against their fiercest rivals England. Flanker Lacans got his name on the scoresheet with a vital try, backed up by wing Lauernt Pardo and two drop-goals from fly-half Guy Laporte. Celebrations began immediately after the final whistle and Lacans was still going strong when picked up by the police outside a Mayfair hotel. A charge of being drunk and disorderly and a court-ordered £10 fine followed. In the year of the inaugural Rugby World Cup France secured a second 1980s Grand Slam. At Lansdowne Road it was the intimidating flanker Eric Champ who stole the headlines. His double powered a narrow victory for a French side containing two of the all-time legends of the game in Serge Blanco at fullback and Philippe Sella in the centre. Their status as the No.1 northern hemisphere side was borne out in New Zealand later in the year, when the French lost out in the final of the World Cup to the All Blacks, Blanco having secured their passage to the final with a miraculous semi-final try against Australia. France secured back-to-back Grand Slams with this murderous rampage against Wales at the home of English football. With building work on the Millennium Stadium underway prior to the 1999 Rugby World Cup Wales had migrated to London - with mixed results. Memories of Scott Gibbs' last-minute try to beat England in 1999 should be balanced out by this hammering. Braces from Xavier Garbajosa and fullback Jean-Luc Sadourny made Wembley a decidedly happy hunting ground for a French side, including Raphael Ibanez, Thomas Castaignede, Philippe Bernat-Salles, Christophe Lamaison and Fabien Pelous, that deserves to be remembered among the greats. France became the first team to win a Six Nations Grand Slam in fine style. England had fallen at the final hurdle in 2000 and 2001, not to mention in 1999, leaving Fabien Galthie's men with a shot at history as Ireland arrived at the Stade de France. They began their quest with a 33-12 win over Italy and a narrow 37-33 win over Wales in Cardiff. Champions England fell 20-15 at the Stade de France thanks to tries from Gerald Merceron and Imanol Harinordoquy and a workmanlike 22-10 victory over Scotland set up the final round meeting with the Irish. There was no comparison. A performance of devastating pace and power floored the visitors, with fullback Nicolas Brusque and flanker Serge Betsen both finishing with two tries apiece and Aurelien Rougerie one. With England having finally secured the Grand Slam in 2003, as well as that World Cup thing, the 2004 Six Nations had a decided edge. The semi-final of the World Cup had seen France beaten in the rain and there was revenge on the menu. England had lost to Ireland and travelled with the aim of keeping their hopes alive, but in a tense finish France just had enough to hold on. Having stormed to a 21-3 lead through tries from Imanol Harinordoquy and Dimitri Yachvili, France were pegged back first by Ben Cohen off a Mike Catt pass and then by a flying Josh Lewsey. It was skin of your teeth stuff but France held on for a deserved victory, with coach Bernard Laporte thrilled at the close. "I am very happy because we wanted to win against the best team in the world," he said. "The semi-final is finished. England were the better side in that game and we congratulated them but in this match, we were the best."